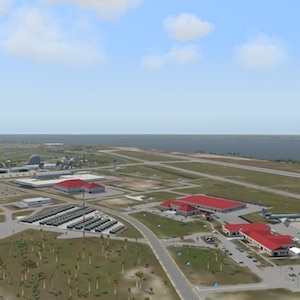 We’re pleased to offer another AFB (Air Force Base) airport created by NAPS, Freddy De Pues. Patrick Air Force Base (IATA: COF, ICAO: KCOF, FAA LID: COF) is a United States Air Force installation located between Satellite Beach and Cocoa Beach, in Brevard County, Florida, in the United States. It was named in honor of Major General Mason Patrick, USAAC. An Air Force Space Command (AFSPC) base, it is home to the 45th Space Wing (45 SW). In addition to its “host wing” responsibilities at Patrick AFB, the 45 SW controls and operates Cape Canaveral Air Force Station (CCAFS) and the Eastern Range. It was originally opened and operated from 1940 to 1947 as Naval Air Station Banana River, a U.S. Navy airfield. It was then deactivated as a naval installation in 1947 and placed in caretaker status until it was transferred to the Air Force in late 1948.